Basil Francis, born 1906, had one main series character, Inspector Ghent. Other than that we are ignorant, please do get in touch if you can help. When Railton, manager of the Southern Bank m Burchester, was found dead with his skull smashed in, it was easy enough to discover a motive for the crime. There were so many ! 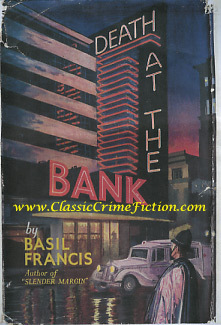 Railton was a first-class cad, and at least ten people had perfectly good reasons for destroying him, as the author of Death at the Bank very capably shows. That Mr. Basil Francis is able to maintain the reader's interest until the final chapters, when the murderer is revealed, points to his undoubted skill in narrative and plot-building, and one feels that a new master in the genre of the murder thriller has arrived. The style is bright and refreshingly free from dullness.